Viva the entrepreneurial spirit! Cambie Street, one of our main traffic arteries here in Vancouver, is almost closed due to construction, but that hasn’t deterred Firefly Fine Wines and Ales from opening their sassy, new liquor store. Good selection, knowledgeable staff, and a delightfully cheeky sense of humour – to date we’ve never seen a store that groups its wines into sections with names like Spicy, Crisp, and Black Teeth (the biggest, fattest, in-your-face reds in the store). On a whim, Friday seems like a good day to check out their latest tasting: three wines from Chateau Pesquié, a family-run vineyard that operates on the principles of sustainable agriculture in the southern Rhone Valley, France. Sujinder Juneja, from Freehouse Wine and Spirits, is pouring. First up is a 2005 Le Viognier (100% Viognier). He and I instantly agree this wine is elegant and classic with an almost austere freshness and pleasing minerality. We both suspect it may be similar to the Condrieu wines Frank is so enamored with, but since this was a spur of the moment stop for me, Frank is unfortunately not here. Still, at $29.80, I’ll pick up a bottle to see what he thinks. Next is a 2004 Les Terrasses: 30% Syrah, 70% Grenache. Black fruits, cherry, and a hint of leather, this one is rich, full-bodied, and will be even better for the folks who arrive later after it’s had time to open up more. “Most people are shocked by the price,” Sujinder tells me. At $19.35, I am too – another bottle to take home hits the counter. Last, we have the just released 2004 Artemia made from 70% Syrah (60 year old vines) and 30% Grenache (80 year old vines) hand picked from specific rows within the vineyard. This is the first vintage of this wine, and it’s an instant hit – especially with a couple of the Firefly staff who’ve just joined us. The consensus is that Artemia is lushly powerful fruit with a pleasing hint of chocolate on the nose, well balanced, and should age well. Tannins are soft, and the 15.5% alcohol isn’t overpowering. At $60, however, this one will have to stay in the store for another day. And finally, just for fun, here’s an intriguing website Sujinder passed on: www.rhonegang.com. Three progressive winemakers clearly having a great deal of fun as they join forces to promote their wines. 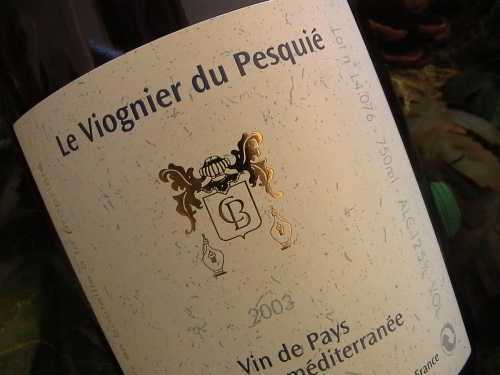 This entry was posted in Chateau Pesquie, Grenache, rhone wines, Viognier and tagged Cambie Street, Grenache, Rhone, Syrah, Vancouver, Viognier, Wine, Wine tasting descriptors. Bookmark the permalink.